The Craigmillar Community Arts contribution to World Community Arts Day is: Be Arty – Be Healthy – a festival of all the arts providing an opportunity for people to paint, sing, write, act, make crafts, make instruments, dance and listen to live music and have fun while picking up health information, advice and tips. It’s Sunday 17th February from 12 noon – 4pm at Craigmillar Community Arts Centre, 58 Newcraighall Road and it’s free! Create art for the whole day! Community Arts Day is a day when regular classes are cancelled at Raymond Elementary School, and students and staff, create art for the whole day! 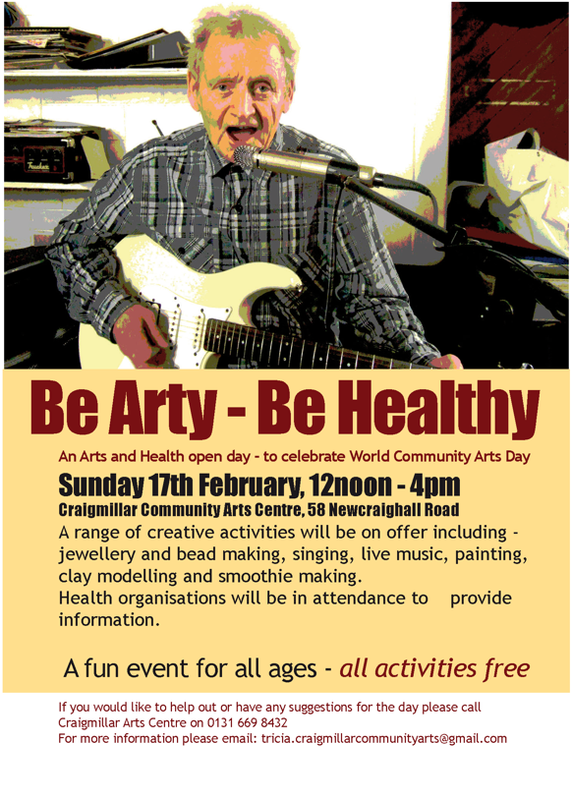 The 7th World Community Arts Day will take place on Sunday 17 February, and anyone can get involved. The ethos of this special day, is ‘Arts as a catalyst for caring and sharing’, and the aim is to create a ‘World festival society for a day’. The Edinburgh-based organisers are asking anyone and everyone to do an arts project, however small or big, on 17 February. You could sing, dance, make a piece of theatre, draw, paint, write, make something, take a photograph, give a lecture – anything that you feel is creative! In previous years, World Community Arts Day has attracted participants from Brazil, Slovenia, Australia, USA, Ireland, Mexico and many more. Ode to a veggie Haggis. What better way to celebrate Rabbie Burns night with a great community arts storyteller Tim Porteus. Exciting plans at Rawlins College, Quorn, Leicestershire as we get ready for our 5th WCAD event. Student and community volunteer led workshops including nail art, mobile making, badge and jewellery making, wool crafts, clay plaques and 3D inventions. Ours will be on Feb 15th to fit in with school holidays. There was an exciting meeting in Govan Glasgow this week. How can we bring these many projects together to raise the profile and importance of what we do. Clearly there many projects ongoing, many people with the same thoughts and actions.